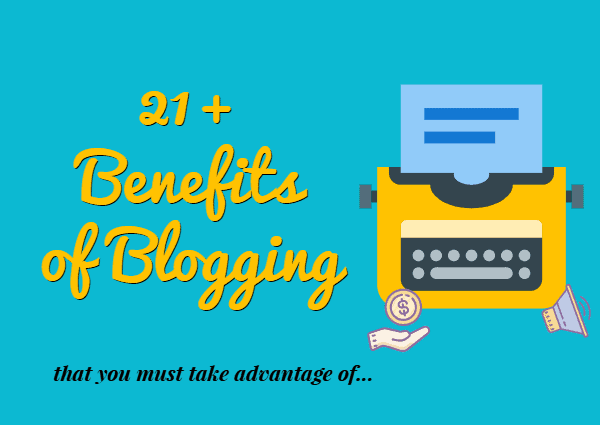 21 Compelling Benefits of Blogging: Let The Facts Do The Talking! On the fence deciding whether starting a blog is for you or not? If that’s an yes, you’re at the right place! In this article I’ll try to list the most lucrative benefits of blogging that non-bloggers are missing out on. Blogging has been around since 1.5 decades. But, the approach of using a blog for personal and professional benefits has exponentially increased in the last 7-8 years. Blogs have transformed from “online journals” to “powerful platforms” that anyone can use to build a fan following, showcase their talent, build a business that let’s them travel the world debt-free and also generate leads and sales for their online/offline businesses. For all those doubts like, is blogging a good career option? or why should I start a blog? Bonus: Why should you blog & how blogging will improve your life? Benefits of blogging In 2019: How to leverage it for your advantage? 1) What are the advantages of blog over a website? 2) What will a blog do for a company? Blogging has evolved into a profitable business idea that requires no (or little) investment. You can monetize a blog and earn a decent income online. While there are sufficient examples of successful bloggers who make a lucrative 6-7 figure in US dollars out of their blogs, it is safe to assume that sky is the limit. Blogging is now a full-fledged business channel that can help you get online, increase your reach and get business leads and boost your revenue. When I graduated I couldn’t get a job (due to family issues) and I was depressed. I was sitting at home and wasting my time for at least over a year when one day I came across a website that taught how to earn money by starting a blog/website. After some initial struggles I gave it a try and now I make a living online, living life laptop style. My blogs (not one, I now have multiple blogs) generate at least $6000-$8000 per month (that is 5,60,000 INR) without working under anyone. (I am not bragging this. I know my peers make a lot more than I do and this is to show you that it is possible to be financially independent). In fact, I now own a private limited company. I’m glad I took this route instead of working for someone else’s company for $200 or $400 per month. Read this article on how to make money from your blog to know more. Blogging gives you an opportunity to write regularly. With a blog in hand you’ll be publishing articles more or less on a schedule and this helps you setup a writing habit that is hard to break. If you aim to become a writer one day or publish a book of your own, blogging is the best way to build a practice-pitch for it. When I was starting out, I could hardly write 300 to 400 words daily not to mention the terrible quality that they were (you can still go find some of them on my blog!). Eventually, I learnt to write more and write better. I am not perfect yet, but one of the best benefits of personal blogging for me was I could write faster and better. Writing more and writing regularly itself helps you deliver (your ideas to paper) faster. Blog post writing involves research, writing, proofreading and editing (manually and using free tools like Grammarly) to write flawless articles. You also get feedback from fellow bloggers and blog readers that help you further improve your writing. Better crafted blog posts bring in more readers, boost engagement and often more revenue so this acts as a reward to motivate you to write more. The main benefit of personal blogging is you can get in front of an audience that you never knew existed. I think this is one of the most important advantages of having a blog. With the help of personal blogging, you can share your thoughts, things you like, stories you want to tell and moments you want to share with either a global audience or a closed knit readers consisting of family and friends. Blogs can offer you a global audience that wouldn’t otherwise be possible so easily. When you start telling your story, when you start blogging your heart, people start to notice your talent slowly but steadily. Some of your efforts might not be fruitful while others will establish a deep connect with your audience. And gradually, they are likely to follow along what you say, wait for you to publish your next piece and then become your raving fans. Gary Vaynerchuk (or some of you might better know him as the motivational, full of energy Gary Vee) leveraged blogging and social media to build his brand up from ground zero. Gary, apart from running multiple own businesses now, is a highly sought after public speaker, a 5-times New York Times Best-selling Author, and a very prolific angel investor in brands like Facebook, Twitter, Tumblr and Uber to name a few. Well, we all might not make it that big (or who knows some of us can surpass him) but it definitely is an example of digital platforms like blogging can help you get more visibility and build your brand online. If you’ve a skill but lack a platform, blogging has got your back covered. With your blog, you can sell digital products like eBooks, mini courses, membership sites and other digital products like video courses or simply meal plans. If you’re looking for an example look no further than Kayla Butler from IvoryMix who makes a living selling digital info products off her blog. that’s what blogs are good for – plain passive income! While all this time we discussed how blogging can help yourself, let’s focus a bit on how blogging can help others? For people to read your blog, become your fan and/or buy from you, you need to be giving them something, right? One such way of blogging for people is through blogging you can help others learn a skill you’re a master at (like guitar lessons or marketing skills). Helping someone step up their game with your expertise is the biggest benefit of blogging in my opinion. But how can helping others help me? In return, you earn their trust and build your credibility as an expert. You can thus leverage this to sell products, personalized courses, or any related services to monetize your blog. Michelle Gardner of MakingSenseOfCents.com teaches your audience to live a frugal life, live more and earn more via her blog. In return she makes a very lucrative 6-figure monthly by referring them to various surveys, frugal lifestyle programs, sponsored posts etc. The next advantage of blogging will help you make even more money! With blogging you have an unfair advantage of getting in front of your potential clients that would otherwise never hear of you. With Blogging and SEO, you can write articles solving queries that your potential clients have. And when they search for solutions of their issues, your blog pops online. They click on your blog result, read your high quality article that solves their pain and like that they come to know about you. Normally, they’d remember your brand and try to get in touch with you when they’re thinking of getting your service but you can also place a link to your portfolio or hire me page to prompt them to hire you. Getting coaching offers, or getting invited to speak at conferences or meetings are other advantages of blogs that you can get. Isn’t it one amazing benefits of blogging for SEO? Are you a writer or want to make a living online by freelance writing? Freelance writing is a very profitable online business idea that requires almost no investment. If you’ve got a good command over language or specialize in a subject (like health, digital marketing, branding, law, fiction etc) you can make a decent income by providing content for industry blogs and company blogs. 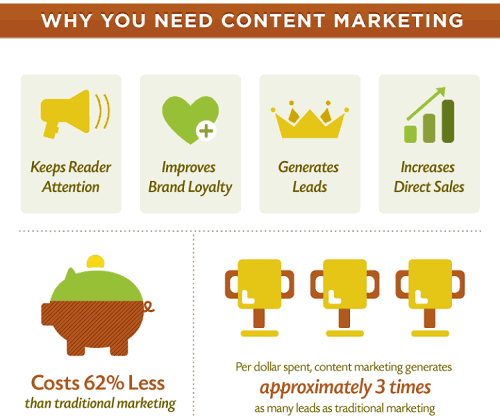 Content marketing has been on an ever increasing demand because of it’s high ROI and so is the demand for freelance writers. Being a highly sought after freelance writer myself (I now focus on blogging for me, though) I always recommend you to start your own freelance writing website (see mine here) instead of content farms and getting clients through sites like UpWork etc. Having your own blog can help you grow trust, boost credibility and act as your portfolio online. You can also land clients by ranking your blog for targeted queries your potential clients will be searching thereby increasing your reach. With a blog, you get the power of reaching out to a medium it would be impossible with normal traditional media. If you’ve an expertise blogging can be the best way to show that. You can use this benefit of blogging to reinvent your online identity and establish yourself as an authority in your field. There are numerous examples of bloggers who’ve established themselves as an authority in their fields via blogging. Marie Forleo, the thought leader you might have heard, started from a single laptop and her blog before reaching to the highest levels where Oprah Winfrey would call her the thought leader of the next generation. Marie today inspires millions of women and men to start a business of their own, grow it and be independent. Do you have a course to sell but don’t know where to get potential visitors? Well, you can surely get a lot of them via social media ads but they would cost you a fortune which might not be something you’d want in the beginning. Having said that, blogs are a good medium of online marketing for your courses. With blogging you can generate organic traffic that is related to the topic of your course. Alternatively, you can use a blog to validate the idea of your course. If there is potential, you’ll see interest from people and then you can send these people (or build an email list) to your landing page where you sell your course (or offer pre-registrations). There are a lot more benefits of blogging for teachers in education, I’ve listed them below. Becoming an author is not that difficult these days thanks to blogging. A blog allows you to improve your writing, create an audience and showcase your talent to potential publishers and book agents. There are a lot of examples of bloggers who landed their dream book deals via the talent they showcased through their blogs. One such example is Pamela Slim who started her blog as a class assignment that she took. Soon her blog became popular and caught the eyes of industry leaders and influencers like Guy Kawasaki. She was approached by Penguin/Portfolio (and not the other way around) about a potential book deal which she gladly accepted. The purpose of blogs is to connect people. Similarly, if you’ve a good influence online you can land brand deals and collaborations because businesses are always looking for influencers to promote their products. There are a lot of instances where bloggers have closed gigantic deals with brands because of the influence and reach their blog has on the readers. Kristina Bazan of Kayture.com (a top fashion blog) recently made a deal with L’Oréal Paris and become their brand ambassador. Read more about this and some other similar 7 figure contracts here. I don’t want to give any false hopes, reaching the level to collaborate with a brand of the stature of L’Oréal Paris is not something everyone can do but small collaborations are a very popular and working model of blog monetization. You might have heard about product reviews or read a review of a product online, those are often sponsored posts by brands to create product awareness. You can very easily make up to $2000 per month selling sponsored posts and reviews on your blog. But, what if you already have a business? The next benefit of blogging has got your back covered! Blogging gives you a very good upper hand when it comes to digital marketing and content marketing. According to latest content marketing metrics, blogging helps to improve sales lead quality (87 percent); sales (84 percent); high conversion rates (82 percent); sales lead quantity (71 percent); website traffic (71 percent); brand lift (69 percent); SEO ranking (87 percent). With blog posts that educate people, help them connect to your business values and company culture you can actually use blogging to humanize your brand. With local SEO, you can get targeted leads and potential customers when they search for your business online. You can then easily filter out those leads or send them to a landing page where they get more details about your service, work hours and fees. Other than that, you can also provide free guidance related to your niche on your website. When users search for those tips they can easily find you and hire you or buy from your physical store. According to a study, 75% of people who find local, helpful information on Google search results are more likely to visit the physical stores than the rest. if you’re a law attorney or provide legal services you could write about related issues like “how to file a divorce” and when people searching for guidance online, you can appear on Google or any other search engine and chances are you can get hired. Here’s a random Google search I made on “how to file a divorce” and this site popped up #6 or #7 on the first page. Take a look at some of the key terms people are using to land on this page. You’ll agree, all these people have a strong intent to spend money on services. Once these visitors land on your blog, you can use conversion rate optimization techniques to boost sales and revenue from them. While blogging can make people listen to you and like you online, you can also use blogging as a powerful medium to change public opinion, inspire them and bring the best in them. Business use blogging to change the perception their customers have (we’ll look more of this below) but you as an individual blogger or a non-profit organisation can use blogging to motivate people do right things. GiveWell, a nonprofit organisation that focuses on shortlisting best deserving charities through thorough research, uses blogging as a medium to raise awareness about charities, inspire and change people’s mind towards donating and helping the needy. With all the passive ways to generate blogging income that you saw above, blogging is a great way to generate revenue online. While it’s nice to believe that all these revenue are passive, a lot of efforts go hand in hand to reach that stage. Brand collaborations, ranking in Google take a lot of effort, dedication and consistency. But, blogging can make that happen. Brian Jackson and his brother Brett Jackson paid off over $135000 of debt in two years, thanks to their blogs. Membership sites are gated or paid content sites where users subscribe (monetarily) to get access to premium content (courses, info products, tutorials, forum access etc). Membership sites are a great way to earn recurring income online because users often continue the subscription to maintain the subscription in return for the premium content. Blogging is a great way to form an audience and increase the exposure of your membership site to new readers and potential members. While not many of us would want to choose blogging as their career or business model but blogging nonetheless can help you in many other fields. If you want to raise a charity or collect funds for a social cause. Blogging is a great way to get your cause in front of a whole new audience. Connecting people is one of the top purposes of blogs. Blogs help you speak your mind, connect with other audiences and form a community online. Blogging is a better community platform than social media because this allows you to speak your mind and control how you interact with others. Social media doesn’t let you own your community while blogging does. I can personally vouch this benefit of blogging. Blogging is not simply about writing or expressing your views, it does more than just improving your writing skills. learn human psychology, conduct A/B split tests and a lot more. Wondering what is the purpose of a company blog? To drive traffic and bring new business leads. If you’ve a business website that generates no visits leave alone generating leads, blogging can help you blow new life into it. Business blogging or blogging by businesses is a great way to get new visitors to your company or small business website. A recent study reveals websites with an active blog generate 67% more leads and have 434% more indexed pages than those who don’t (source: SEO statistics 2019). This means the more indexed pages (pages that are crawled and hopefully rank on Google) the more is your business’s reach. To get your book deal, to land your brand collaboration, to lock freelance writing projects you’d need one thing that is a portfolio, for sure. Blogs are an inexpensive and popular way to create a portfolio online and showcase it to land your dream job or clients. As per MediaBistro, 9 out of 10 companies check out your online profiles before making a hire. I think this SEO strategy is a great one because if you’re a potential candidate and you have no clue how your personal brand is perceived online, you wouldn’t be a fit for the job. With all the above advantages of blogging I hope it’s clear that blogging isn’t just a hobby. Besides the business benefits, blogging can help you elevate your life, give you a way to vent out your emotions and do something meaningful in life. giving you the power to inspire others with your stories and create a bigger, better change in them. Now that you know all these benefits of starting a blog, the next logical step would be to use this advantage of blogs for your own benefit. If you want to get started blogging, I’ve a very easy and step-by-step guide to start your blog in the next 10 minutes. This guide has helped 4000+ readers get started right from buying a domain name to writing their first blog post. The main advantage of a blog over a website is that, a website is generally static with no fresh content while a bog is regularly updated with fresh content, ranks better on Google (because it targets more keywords via it’s blog posts) and attracts more readers. A blog is generally more visitor/reader friendly than a static website. A blog will help a company rank better on Google thereby helping it to direct organic users to the company website. Another thing a blog will do for a company is help it get more leads. blogging can help you humanize your brand by writing and focusing on your users’ stories. blogging can make yourself more approachable for your readers. Excellent post with great tips. Thanks, Swadhin for sharing this in-depth & informative article on the advantages of having a blog. Really helpful! to read everything in a single place. Good to hear that this is a wonderful and informative piece of writing for all those who want to get into the field of blogging. By this post, I was also trying to convey the message that a blog can be utilized for various purposes based upon the skill sets and abilities of a person, whether they are inborn talent or cultivated one. Your article will help me extract the exact benefits of having a blog. I had always been thinking about how & why to start a blog and now this post lists 23 epic advantages of them. good opportunity to build our identity & learn the new things. The 6 points that blogging helps to improve the life are great and are so true. The benefits of blogging for marketing & seo that you have listed are amazing. As this post will motivate many people for doing more blogging. Great article and thanks for sharing such an informative article. I was such a bad writer and very unknown. Blogging made me a better writer and I have become known locally and worldwide. I get invited on radios and live events to speak blogging and guess what? Money comes in. So any one on the fence should quickly jump on the side of blogging. Thanks so much for appreciating the post. Ah, I strongly disagree. I don’t think you’re ever a bad writer. Right from 2014, the day I read one of your guest posts at Aha!NOW I was a fan of your skills! Needless to say, you inspired me and I am sure many others. But yes, with these radio and other opportunities, I am sure blogging can only make this possible.